The thesis that trouble in the brick and mortar retail sector means We're DOOOMED!!!! is not borne out by the wider array of indicators. Thanks to a very busy work schedule, I've had less time to monitor and write about the "analysts" at Hot Air. But, now that I've got some time, let me play a bit of catch-up. The loss in retail jobs is curious, too. Consumer confidence hit a new high in March, part of an upward trend that started in … October 2016. We’ll get the 2017 Q1 GDP report at the end of the month, but the trend on personal consumption expenditures was good for the last three quarters of 2016, finishing with a 3.5% annualized quarter-on-quarter increase in Q4. Some big-box chains are struggling at the moment — JC Penney, Sears among them — so perhaps it’s more of an adjustment within the sector. Actually, it's more than an "adjustment" within the sector. This may have escaped Ed's vast reading spindle, but there is a little outfit called "Amazon" that has completely upended the retail environment. It's led to several bankruptcies and numerous other store closings. In short -- it's not an "adjustment," it's a complete rethinking of the retail sector. Also observe what Ed doesn't note -- the 53,000 drop in construction jobs and the 50,000 decline in education and and health employment. It's almost as it he can't read a simple table or do simple math. 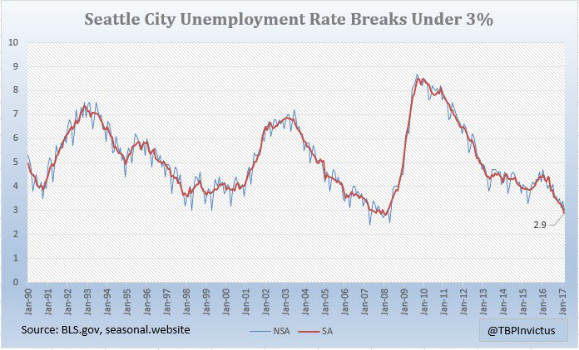 Despite raising the minimum wage to $15, Seattle's unemployment rate continued to drop and is now at 2.9%. Once again, the research of Alan Kreuger is born out at the expense of idiots like Jazz. 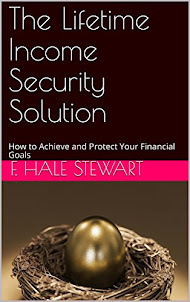 I realize that picking on the economic skills of Ed and Jazz is unfair. Neither have any formal training in the topic, so they're bound to get basic points wrong. But they continue to write horribly misguided analysis under the erroneous belief that they have meaningful analysis to offer. And that makes them fair game. Once again, reality -- as in facts and data -- have intruded into Hot Air's little economic world to disprove their basic theories. Will they print retractions or corrections? No -- those are only required for the liberal press. Conservative bloggers have no such code of ethics. January was revised downward by -22,000. February was also revised downward by -16,000, for a net change of -38,000. NOTE: Beginning next month, I will begin keeping track in the headlines of both manufacturing and mining job growth. Better news in these numbers was a central part of Trump's campaign, and after a 3 month grace period, I think it is fair to begin to see how well - or poorly - he is keeping that promise. the average manufacturing workweek was fell from 40.8 hours to 40.6 hours. This is one of the 10 components of the LEI. construction jobs increased by +6,000. YoY construction jobs are up +177,000. manufacturing jobs increased by +11,000, and after being down YoY for a year, in the last two months have now turned up. temporary jobs increased by 10,500.
the number of people unemployed for 5 weeks or less decreased by -232,000 from 2,566,000 to 2,324,000. The post-recession low was set nearly 18 months ago at 2,095,000. Overtime fell 0.1 from 3.3 to 3.2 hours. Professional and business employment (generally higher- paying jobs) increased by +56,000 and are up +639,000 YoY. the index of aggregate payrolls rose by 0.3 from 132.6 to 132.9.
the alternate jobs number contained in the more volatile household survey increased by +472,000 jobs. This represents an increase of 1,699,000 jobs YoY vs. 2,185,000 in the establishment survey. Government jobs rose by +9,000. the overall employment to population ratio for all ages 16 and up rose +0.1% from 60.0% to 60.1 m/m and is up +0.2% YoY. The labor force participation rate was unchanged month m/m and YoY at 63.0%. While the headline for most summaries of this report will probably be the miss in the headline jobs number, the deeper trends appear to be a continuation of what we have seen for the last few months: significant declines in both the unemployment and underemployment rates, a continuing sharp increase in labor force participation (the biggest in nearly 30 years), but continuing wage growth stagnation. These trends are probably linked. The big move from people off the sidelines into the labor market is probably helping keep a lid on wage growth. The only other negatives in the report is the stubborn high number of people outside of the labor force who want a job now, and the decline in the manufacturing workweek and overtime. All in all, this was a quite positive late cycle jobs report, as the YoY% gain in jobs continues to decelerate, but remain positive. The return of the Doomers: OMG it's a slight pullback! There finally was enough of a soft patch in the data for the Doomers to raise their heads out of the peepholes. They're still wrong. First of all, sorry for the light posting this week. I've had some urgent business I need to attend to irl. I don't know where he got the 57% statistic from, but if it is true it is potent evidence that the main factor behind the 60 year long decline in prime age labor force participation by men is an increase in those on disability, probably due to both the expansion of the program, and better longevity and diagnostics -- and probably also tied in to opiate addiction as well.